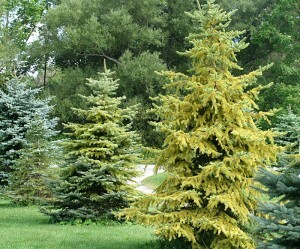 Buffalo-NiagaraGardening.com > Garden tips > Q&A: What’s turning these evergreens yellow? Q&A: What’s turning these evergreens yellow? Photo from from Kristen Reumann. Occasionally we post questions from our readers. This reader has asked around and hasn’t been able to find anyone who knows what’s wrong with her trees. If you can help, please leave a comment below. 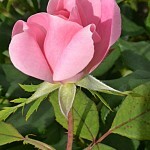 We also have a returning question from last week regarding transplanting roses. I know there are lots of gardeners out there who have transplanted roses and can respond to this question. Don’t be shy; just tell us what worked for you. I have three rose bushes that I want to transplant. Any suggestions to how I go about doing this and any fertilizers I should use? Also, should I cut them down to 2 to 2 1/2′ prior to the transplant? 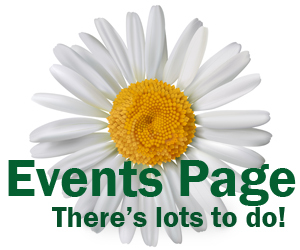 Please offer any advice or tips that you have found useful through the years and leave a comment below. Thanks! I also have a flowering tree, not quite sure what it is, but it’s not doing well. I’ve trimmed it down, removed the dead branches and dug down a little and put compost down. It stands about six feet tall. Any suggestions what I can do to revive it? You’ll see the responses below. Here’s a photo of the tree in question. You should transplant in early spring when it is nice out. (I know those days can be few and far between some years!) You want to get up a good root ball with soil still attached for best success. Yes, cut the roses back. I would not keep more than 2′. You do not want lots of top growth that the transplant can not support. 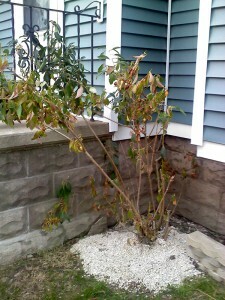 Don’t worry once the roses settle in, they will make lots of new growth. Have new holes ready to go before you dig up the roses. Prepare the new spots with added compost and peat moss mixed into the soil. I personally like to dig down as far as I can in my clay soil probably about 1 1/2′ and remove the worst offend clay which would be about 1/3 of the hole and replace that with the compost and peat moss. Add a little bone meal if you have, but do not add regular fertilizer. You want the roots to settle in. You do not want energy to go towards top growth. That will come once the rose is ready. I’ve grown many roses over the last 40 years and I’ve planted them during most of the year. Ideally, spring and fall for planting as the air is cooler but the soils are still warm. Before transplanting, I prune them down to about 10-12 inches. I dig their new homes first and have them prepped. The old adage,crowns above the Mason/Dixon line below, crowns below the Mason/Dixon line,above holds true; Meaning that in our clime or zone; you’ll want to make sure the crown of the rose bush is below grade. Dig far enough away from the trunk of the plant to insure a good root ball. I always use a starter fertilizer when planting or transplanting. Just use per directions on the bottle, usually 6tblsp. to a gal of water in a sprinkling can. It promotes root growth and helps the plant to become established. As the previous poster said, use compost and peat. Peat is slightly acidic and roses while heavy feeders and drinkers are acidic loving. Backfill with the compost,peat, and native soil mix.Water deeply,but not frequently. When first planted, water deeply and every two to three days for about a week and a half. This will help the roots to find their way through the soil and ensure their getting enough moisture where it counts. I usually leave the hose on trickle right at the base of the plant for about 30-45 min. when first watering. 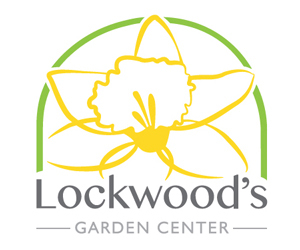 With a little tlc, regular feeding after they’re established you should continue to have wonderful blooms. 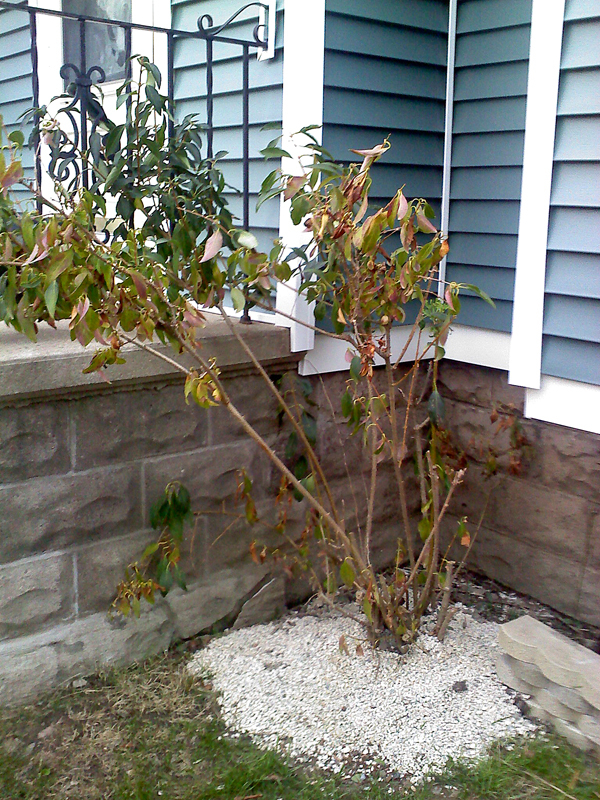 I also cut my roses down in late fall and again in spring (removing any dieback). For the spruce trees above..the yellowing looks like lack of moisture by the overall yellowing(this summer has been brutal). Take the photo and a branch to your local co-operative extension and they can probably make a positive diagnosis. On the yellowing pines: it may be spider mites? 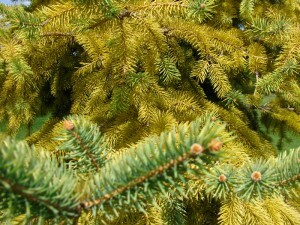 I have two miniature Scotch pines in my beds in OP and every so often will get an infestation; they go yellow first but then the needles do drop; the mites can eat an entire side of an eight-foot tree within a week if not caught in time. (Oddly enough, there is no problem with these pines out on our property in Wales.) I know there are spider mites when I find them on our patio furniture; they are extremely tiny and look like a pinprick of blood when crushed. Leave a piece of white furniture near one of the trees to see if there is evidence of spider mites. Unfortunately, the only thing that works on them is the really powerful stuff like Sevin, which scares me to death when I use it; I wear a face mask. Remy, thanks so much for the detailed advice and the photos of your roses. I especially like orange roses. Rhonda, I was interested to hear that you’ve had success transplanting roses in fall and that you prune them. 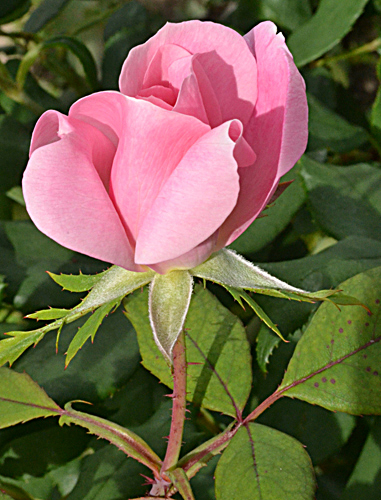 When I interviewed the late Lillian Stiegler of the Western New York Rose Society, she explained that you should prune roses in spring rather than fall. You don’t want to prune roses now because you want the plant to go dormant in the fall, not spend energy trying to grow,she said. Can you explain why you prune them? Is it to make it easier to move the plant? And I suppose if you’re transplanting the bush, you don’t want it to go dormant until it sets new roots, so it might be a good idea to prune. Rhonda and Lorraine, thanks for those possible diagnoses. I appreciate you taking the time to write. Hello, Connie, as the temps get cooler; I don’t find that growth stimulus is a problem. The roses are slowly going dormant. I prune them down before winter as I don’t wrap them in burlap and find the drying and damaging winds don’t bother them as much. Breakage can occur when the stems are long and I find more problems with that then worrying about new growth. I usually do a clean-up on the stems in the spring as there is always a little die-back on the canes. Good growing practices lead to great roses. I’ve never had a problem and some of my roses I transplanted from my other home are 35 or more years old. As for the spruce tree;I didn’t mention spider mites as usually it appears from the inside out from what I’ve seen. I usually don’t see that pale yellowing unless there is lack of moisture or way too much of it.Spider mite damage usually will be noticed before the tree gets that far along. Again, taking the photos and a branch to a co-operative extension agent will give you a better diagnosis. Rhonda, thanks so much for that great clarification! I’ve transplanted four rose bushes all went well. Now just hope they like their new home and bloom in the summer. I’ll keep you posted as to their growth. Thanks again for the help. Any suggestions as to potted mums. Should I plant them in the ground or leave them in the pots and put in the house over the winter and water till next summer? Hi Jeanine, what is exavtly happening with the tree when you say it’s not doing well? No blooms, yellowing leaves,dry crisp leaves, dieback at the crown, funky(not a horticultural description ;D)growth on the branches. We prune to shape,control growth,remove crossing branches,dead branches,deadhead and so on. I’m not sure what you meant by dug down and put compost down. Did you expose any roots? How was your watering situation this summer? Let me know and I’ll see if I can help. Also, a picture is worth …you know the rest. Looking forward to hearing more. Rhonda. Jeanine, here’s an article that discusses overwintering mums. Yes to all of those yellowing leaves, no blooms, dead branches, no funky growth on branches. I watered every day in July and Aug. I did not expose any roots just dug down about 5″ around the base of the tree and put compost in. I don’t know how to post a picture on here any suggestions? Rhonda, thanks so much for steering Jeanine in the right direction. I’m so sorry that it took me so long to get back to both of you. My Internet service has been down since Friday afternoon. My phone was affected, too. I invested way too many hours trying to get the company to fix it when I should have been looking for alternate solutions. I’m currently using my neighbor’s Internet and hope to have my service up and running today. I received one photo from Jeanine and have posted it in the article. We have the same thing have happening to our evergreens and it’s really weird.